When you're working in industries with mechanical risks, the safety of your wrists is often overlooked, making them more vulnerable to injuries. The Towa ActivGrip 30cm Liquid Resistant 566 Gloves feature longer cuffs to enhance your wrist protection. Designed with a full nitrile coating, the gloves help protect you against the penetration of liquids. The gloves also use MicroFinish technology to provide additional grip in wet and dry conditions. 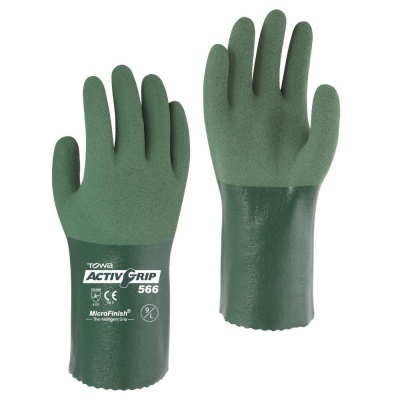 The Liquid Resistant Work Gloves are available in four sizes to fit most hands. Please measure the circumference of your hand around the knuckles (excluding your thumb) with your palm open and your fingers together. These gloves are 30cm (12") in length for improved wrist protection.